The paradigm has shifted – access of information through mobile is considered as the driving force of many important industries across the globe. The advent of wireless fidelity, long term evolution, 3G and similar innovations created an omnipotent portal to knowledge. Communication is made much easier; the world is continually shrinking, and the human connection is no longer measured in degrees of separation but friend requests, circles, or follows. Kristine Peters, a researcher from Flinders University in Australia, noted that “mobile information and communication technologies are important enablers of the new social structure.” She said that society is experiencing the ongoing rise of truly “portable” ICT (information and communications technology) driven by the consumer’s fancy of mobile gadgets such as tablets and iPhones. In the United Kingdom, news reports still show that sales of the iPhone 5 remain unfazed, driven by deals offered by network providers. In fact, O2 is continuously attracting more iPhone 5 fans daily, especially with their current drop of prices. One of the greatest advantages of this shift to mobile is the decreased dependence to fixed work and to learning places. Data transfer through wireless networks paved the way for a more flexible working condition, and relaxed definition to the term ‘workspace.’ This affects all aspects of the business system – including training. Mobile learning is gradually being considered as a standard method or practice in many institutions. In the past, corporate and academic training never meant teaching in the most classic set-up possible. Face to face meetings and online aids accessible at home used to be the standard practice. Training Magazine said that almost everyone has access to internet via smartphones and tablets, anyone can train on the go. The most effective training method today is the one that offers the least intrusion to a trainee’s schedule, the magazine added. 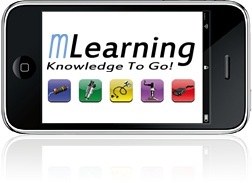 What this means is that mLearning is the best possible way of training people. Training need not be scheduled at a certain time or day. Ubiquity means training is anytime, anywhere. School of Economics of London study concluded that technology widens the barrier between generations. This ‘generation gap’ demonstrates one of the key points against mLearning as an effective training method. The trainer – trainee relationship might not go well smoothly when the trainee has more knowledge than the trainer. A separate research featured by FlexibleLearning.com found out that even if trainers use mobile technology for clerical tasks respondents said that they would very much prefer if they used the mobile device as a teaching tool instead. Fannon, the author of the said research, even said that almost half of the respondents were willing to be trained only with the use of a smartphone. Mobile applications usually gather personalized information regarding the user such as current location, time, and status. GPS detection by apps created a very personal cloud of information that is as unique as the DNA makeup of its user. As far as training in the workplace goes, a context sensitive device is practical when gathering data. Being ‘context aware,’ mobile learning is made extra dynamic. “When using applications in these [context aware] settings, a user has much to gain by the effective use of implicitly sensed context,” said Anind Dey and Gregory Abowd in their research paper about context and context awareness. Apps that are considered smart or contextually optimized provide invaluable task-relevant services and information to every trainee. In conclusion, mLearning is the most practical and logical method in training people in corporate, academic, or institutional setting. The advent of new technology and the continuous upgrading of the human capacity to gather information have led to an era where learning can be made to measure. Clearly, the educational use of mobile technology brings many incentives, which traditional training methods cannot provide.